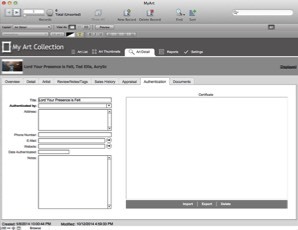 Designed for: Individual collectors or artists managing one collection or a body of work from a single computer. 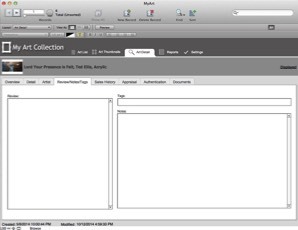 Designed for: Individual collectors or artists managing one art collection or a body of work from a single computer with the need to store scans or digital documents pertaining to a piece of art. collection file from a desktop, laptop, iPad or iPhone. 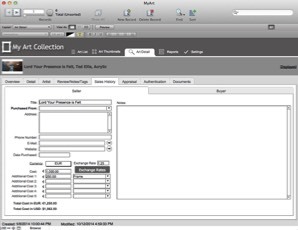 One time fee, no recurring costs per month, safely store you collection on your computer. 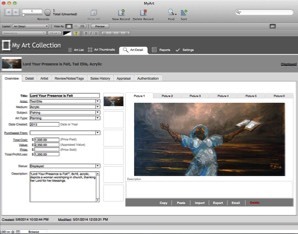 Store unlimited digital documents such as receipts, appraisals, artist bios and more for each art record. Save loads of data-entry time by importing all photos at once. Need to run an inventory or value report for tax season? What about an insurance report? No limitation on the number of records you can keep in each file. 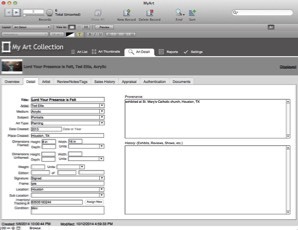 Store unlimited collection records with detailed records and up to 6 images per record. 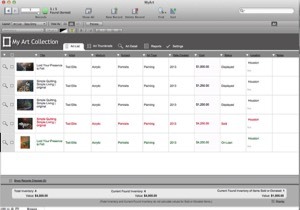 View and edit collection files on iPad or iPhone using the free FileMaker Go 13/14 app and iTunes to move files between your desktop/laptop and iOS devise. If you change from one to the other you can take your collection with you! Password protect files for secure collections. 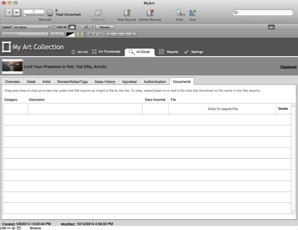 View and edit collection files on iPad or iPhone using the free FileMaker Go 13 app and iTunes to move files between your desktop/laptop and iOS devise. Please note that Windows XP and Mac OS X 10.6 (Snow Leopard) are no longer supported. Please update your operating system before upgrading to My Art Collection 3.0. *Version stated is the minimum requirement. My Art Collection may also work with later operating systems certified by FileMaker, Inc. Operating systems not listed in the table above have not been tested and are not supported. 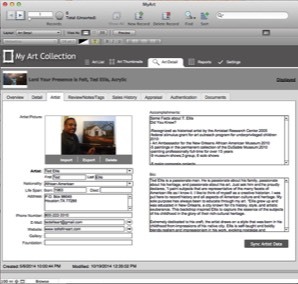 My Art Collection is an easy to use art collection software designed to manage and organize ones art collection in a fast and simple way. It is specifically designed for the needs of the art collector and artist. •	Document your artwork for insurance and organization. •	Store records of all of your artwork, including: art details, artist info, reviews, notes, sales history, appraisal and authentication. 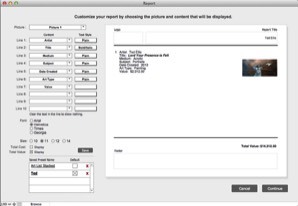 •	Assign pictures for easy visual reference. 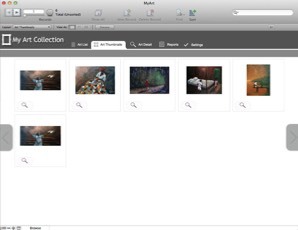 •	Find, sort and view your artwork in multiple ways for any purpose. •	Manage to whom you sold or loaned an item. •	Recall donated items for tax reporting purposes. 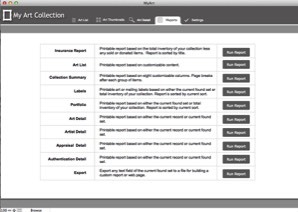 •	Print insurance reports, inventory summary reports, portfolios, art details, artist details, labels and more! •	Import and export to Excel or other database applications. My Art Collection was designed for collectors and artists who were tired of expensive and hard to use art collection/management software. The goal is to build a product that would easily satisfy both collectors and artists with their specific needs, be user friendly and fit into any budget. 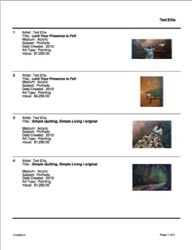 I am so happy that we decided to order My Art Collection database. As the administrator of our growing art collection, keeping track of items had become challenging. Since purchasing and entering the art data into the database, we have been able to catalogue our holdings more efficiently. For the first time I was able to create comprehensive reports to assist our finance department in managing our assets. We also have been able to develop art assignments for our undergraduate students. My Art Collection Database has truly made managing this process seamless. 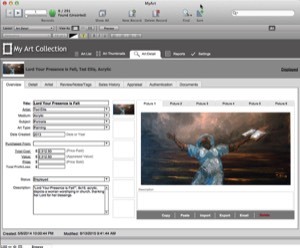 Love, love, love My Art Collection software. You saved my art career. With over 1200 paintings going to multiple galleries, shows and collectors, I was a disorganized mess. Thanks for getting me organized! Our shopping cart does not support IE6. If you are having trouble checking out, please Contact us. “I just finished importing my 118 records. I was really concerned about having to spend days re-entering the data. Your software is wonderful. For the first time, I have my records organized and can quickly find the information I need. Thank you for the great software and for the fantastic support! !